The 36th annual College All-Star Game on August 1, 1969 featured the New York Jets as the pro representative. Last seen upsetting the Baltimore Colts in Super Bowl III, the Jets became the first American Football League Champion to appear in the annual contest sponsored by the Chicago Tribune for Chicago Charities. 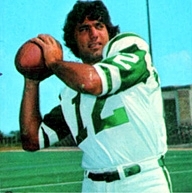 There had been turmoil for the Jets in June when star QB Joe Namath (pictured above) announced he would retire rather than sell his interest in the Bachelors III nightclub, as demanded by Commissioner Pete Rozelle, but “Broadway Joe” finally relented and reported to training camp just two weeks prior to the All-Star contest. On the All-Star side, a shadow was cast by the absence of star running backs O.J. Simpson, the Heisman Trophy winner out of USC, Leroy Keyes from Purdue, and Michigan’s Ron Johnson, who had chosen to skip the game to avoid the risk of injury prior to signing pro contracts. Still, there were plenty of future pro stars playing, including Notre Dame OT George Kunz, TE Bob Klein from USC, and WR Jerry LeVias of Southern Methodist on offense and, defensively, ends Bill Stanfill from Georgia and Fred Dryer of San Diego State, Arkansas State MLB Bill Bergey, cornerbacks Jim Marsalis of Tennessee State and Bill Thompson from Maryland – Eastern Shore, and Missouri safety Roger Wehrli. The team was coached by Otto Graham for the ninth time, returning after a three-year hiatus while he was head coach of the Redskins. There was a crowd of 74,206 in attendance on a Friday night at Soldier Field and many of them loudly booed Namath when he was introduced. The All-Stars looked tight throughout the first half and were especially hampered by their lack of a running attack. The Jets scored first on a 43-yard Jim Turner field goal. Less than four minutes later, New York struck again on another Turner field goal, this time from 16 yards, and the pro champs led by 6-0 after a quarter of play. In the second quarter, the Jets added to their lead as they put together a 10-play, 75-yard drive that ended with FB Matt Snell running the final three yards for a TD. They failed to add to their margin when the All-Stars put together an impressive goal-line stand after the Jets got a first down inside the five yard line, stopping four straight running plays (two each by HB Emerson Boozer and FB Bill Mathis). 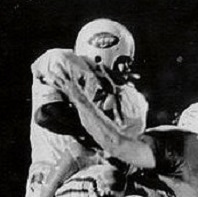 The All-Star defense foiled another possible score by the Jets when Snell attempted an option pass intended for TE Pete Lammons from the three yard line that was picked off by DB Bill Bradley. But the All-Stars were unable to mount a threat as they managed just one first down (which was due to a penalty) and scored no points in the first half with Notre Dame’s Terry Hanratty and Bobby Douglass of Kansas appearing at quarterback. Down 13-0 at the half, the All-Stars fell further behind in the third quarter thanks to Turner’s 42-yard field goal for the Jets. But fortunes changed when QB Greg Cook from Cincinnati (pictured below) entered the contest. The collegians took advantage of a 78-yard kickoff return by RB Altie Taylor to the New York 19 to get on the board. Cook fired a 17-yard touchdown pass to WR Gene Washington from Stanford for a touchdown and Roy Gerela from New Mexico State added the extra point. Following an interception by CB Rudy Redmond, Gerela kicked a 28-yard field goal that made the Jets’ margin just 16-10. New York responded with a 63-yard drive in four plays that ended with a touchdown on a 35-yard sweep by Snell. The All-Stars struck back quickly, however, as Cook tossed a bomb to Taylor in a third-and-one situation for a 44-yard gain to the New York 12. On the next play Cook floated a pass into the corner of the end zone that was pulled in by the 242-pound Bob Klein for a TD and Gerela’s successful PAT made it 23-17, which was the tally at the end of the eventful third quarter. The All-Stars regained possession when Roger Wehrli intercepted a Namath pass at the All-Star 36. Cook completed a 27-yard pass and the All-Stars reached the New York 29 before the drive stalled and Gerela missed on a 37-yard field goal attempt that sailed wide. The Jets, making the most of their reprieve, responded with a 69-yard series that concluded with Jim Turner kicking his fourth field goal of the game, from 18 yards, with just under six minutes remaining to play. It was still 26-17 when the All-Stars got the ball back at their 20 with slightly less than two minutes to go. Cook threw to Jerry LeVias for 11 yards and connected with him again on a big play that covered 59 yards to the New York 8. A penalty on the Jets edged the collegians closer, but controversy ensued on the next play when a throw intended for Gene Washington that was defended by CB Johnny Sample was incomplete. Otto Graham, believing that Sample interfered with Washington, loudly complained to the officials and was in turn confronted by Sample. Graham came away with a bloody scrape on his nose from Sample’s helmet and a 15-yard penalty for being outside his assigned sideline area. Still, the collegians managed to capitalize when Cook handed off to Taylor who tossed the ball back to him and the quarterback then threw to LeVias for a 19-yard touchdown with 16 seconds left on the clock. Gerela’s PAT was successful, but any last chance for the All-Stars ended when the ensuing onside kick failed to go the required ten yards, and the Jets were able to run out the remaining time for the 26-24 win. As close as the score was, the Jets dominated statistically, outgaining the All-Stars by 463 yards to 260 and holding a substantial edge in first downs of 28 to 8. Joe Namath, who was wearing a three-bar linemen’s face mask for the first time in his career, had to remain in the game far longer than Head Coach Weeb Ewbank would have liked due to the All-Star rally. While not fully up to par, he completed 17 of 32 passes for 292 yards with no touchdowns and two interceptions. Matt Snell (pictured above) rushed for 114 yards and two TDs on 19 carries as the Jets piled up 201 yards on the ground. WR Bake Turner, in for the injured George Sauer, caught 8 passes for 145 yards. With a lack of strong runners, the All-Stars gained just 16 rushing yards, on 13 attempts, and the individual leader was Kansas QB Bobby Douglass with 7 yards on one carry. 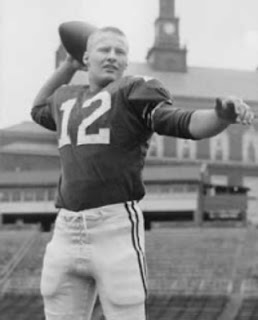 Greg Cook’s passing was nevertheless nearly enough to pull out the contest as he was successful on 12 of 23 throws for 241 yards and three touchdowns. Jerry LeVias was the leading receiver with three catches for 89 yards. In the ensuing season, the Jets went 10-4 to again top the Eastern Division in the AFL’s last campaign prior to merging with the NFL, but they lost to Kansas City in the Divisional playoff round. Joe Namath had another outstanding year, receiving AFL Player of the Year recognition from the Associated Press. Greg Cook had a remarkable rookie season with the Cincinnati Bengals, leading the AFL in passing and garnering Rookie of the Year honors, but unfortunately his career went no further due to his sustaining a serious arm injury along the way.